Discover the Perfect Way to Keep Your Precious Cigars Safe and Ideally Conditioned! The world-class La Cubana humidor is the smart and sleek solution to your cigar storing and preserving problems. Adding this luxurious and long-lasting humidor chest will instantly upgrade your cigar collection! Unsurpassed Style and Exclusive Design! This acclaimed cigar humidor is going to become an excellent addition to your office desk or your bar top. Due to its prestigious sturdy Oak construction and elite craftsmanship, you can rest assured that your premium cigar humidor will be a luxurious way to store your Cubans. Plus, its heavy-duty design will perfectly preserve the aroma and the optimal humidity of your cigar collection. Other Humidors May Come Close...But No Cigar! This elite and classic La Cubana humidor has a premium built-in humidifier and an elegant hygrometer so you can easily keep track of the humidification conditions! You can rest assured that your cigar collection is not going to dry out and always stay in healthy smoking condition. A Unique Gift for Every Cigar Aficionado! This high-end cigar humidor will have every cigar enthusiast ecstatic due to its luxurious and practical design, which keeps cigars safely stored and perfectly preserved. You have now found the Father's Day or Christmas gift that is guaranteed to astound your cigar aficionado friends or family members! 100% Smoking Luxury or Your Money Back! We, at La Cubana, know that you are very selective with your cigar accessories, and that's why we have designed this luxurious cigar humidor to match and exceed your high standards! However, if you are not 100% satisfied, we confidently offer a 30-day money back guarantee! Indulge Yourself! Have A Cigar Humidor You Can Be Proud Of! Click Add to Cart Now! EVERY CIGAR AFICIONADO DESERVES THIS ELITE HUMIDOR - Presenting the superior La Cubana cigar humidor that will make maintaining and storing your priceless cigars a genuinely luxurious experience. Tailor made to cater for your every requirement this premier cigar humidifier is an exceptional and indispensable cigar accessory. THE PERFECT CONDITIONS FOR YOUR CIGARS - The sensational and elegant La Cubana cigar humidor and humidifier set is going to guarantee the ideal conditions for your elite Cuban cigars. Keeping your exclusive cigars at an optimal temperature and maintaining the desired humidity levels, our illustrious cigar humidor is going to become your most treasured cigar companion. UNPARALLELED STYLE AND ELEGANCE- We have designed this sophisticated and smooth cigar humidor with style and comfort in mind. It is built like a fine piece of furniture and will easily become the centerpiece of any desk or bar top. The hygrometer is conveniently placed on the exterior so you can always keep track of the interior humidity. Plus, its classy and luxurious golden side-handles will make it easy to carry. AFFORDABLE LUXURY - Discover the most extravagant and matchless gift for every cigar aficionado. 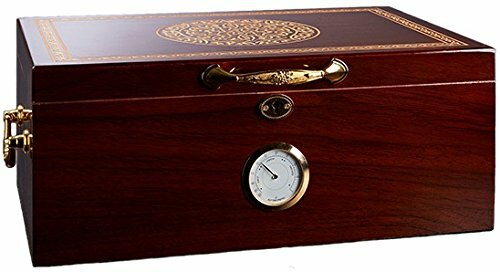 A premium Spanish cedar cigar humidor with a built-in humidifier and hygrometer is a prerequisite for anyone who enjoys smoking a fine Cuban. Amaze everyone by getting this outstanding La Cubana cigar humidor for Father's Day or as a luxury Christmas gift for your loved ones! 100% PERFECT CIGAR EXERIENCE OR YOUR MONEY BACK - We, at La Cubana, continue a long tradition of designing superior cigar humidors to guarantee optimal cigar preservation and humidity. Designed by smokers for smokers, you will be amazed by its refinement and high performance. You can finally indulge yourself risk-free, since we confidently back our cigar humidor with a 30-day money back guarantee. If you have any questions about this product by La Madera Cubana, contact us by completing and submitting the form below. If you are looking for a specif part number, please include it with your message.